Come see all the new PB+ series, on tour of the US. Contact your local dealer for details. Over a quarter-century of product innovation! 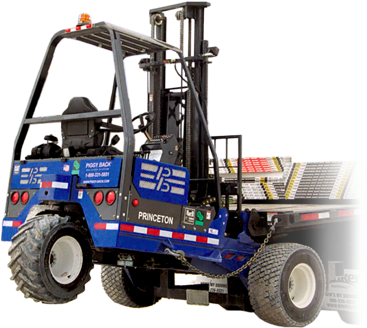 Welcome to Princeton Delivery Systems, the leading manufacturer of truck mounted forklift products and the home of the PiggyBack! See new PB+ on tour! Contact your local dealer for details. Princeton has almost 30 years of truck-mounted forklift experience. The basics are simple, but there are many details to cover to insure maximum productivity and safety. In general, almost any truck or trailer can be modified to carry a PiggyBack®. Princeton features the EZ Hitch® mounting system, which is a proven and tested design. This is also the only mounting system in the industry that features 3 point safety: hook, pin & slack safety chain. The unit is ready to use in less than 60 seconds.